Ideal for group travel, a 15 passenger van rental eliminates the need for bus tickets, taxi services, or multiple cars; at Affordable Rent-A-Car And Sales, we have an assortment of passenger vans ready to be driven to any Utah-area destination. Treat Your Group and Reserve a Van! Each van is fully equipped to seat 15 comfortably (as the name suggests), and even has additional space for luggage and other belongings, so you won’t have to be cramped. 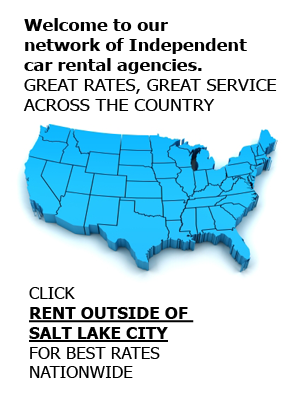 On your next trip in Salt Lake City, take advantage of the most comfortable van rental for your large crowd. Submit an online reservation, or call us at (801) 266-7368 to speak with an agent today. Just two miles from the SLC International Airport, our branch is in a prime location to offer airport car rentals to our clients. We pride ourselves on our timely and affordable pickup and drop-off services, all of which are free to those flying into or out of Salt Lake City. These services simplify your trip by eliminating the hassles of calling for taxis or arranging for alternative transportation to our office. We’ll get your trip started off on the right note! Saving money is one thing – and a 15 or 12 passenger van rental does that for you – but removing hassles from your trip is another. When you rent a passenger van from the experts at www.affordablerentacarandsales.com, you can throw those hassles out the window. Imagine heading to Vegas with your friends for a weekend of lights and gambling, all without having to worry about how you’ll get there. On the flip side, you can also plan your church outing or field trip in Salt Lake City without the stress of traveling in multiple vehicles. Explore Canyonlands National Park, Moab, Yellowstone, and anywhere in between. Wherever the destination, a passenger van rental keeps things in your control. As always, customers can expect from us the most affordable rates in the SLC area, personable representatives, quality rental vehicles, and helpful agents. We always dress to impress, that is, we dedicate our efforts to our customers’ needs. If you’re interested in any of our services or vehicles, including minivans, cargo vans, SUVs, trucks or a car rental, pick up the phone and call us at (801) 266-7368 today. We also offer any of our vehicles as production rentals for film shoots or location scouting, and each rental vehicle is available for sale.